12 Best Interactive Books for Kids That Will Burn Energy...Quickly! 4. Can You Make A Scary Face? This interactive picture book revolves around a tickly green bug and getting it off your body. Get ready to watch your kid try to wiggle her nose, make a scary face, and do the chicken dance – and more. Sometimes, this book even convinces my 9-year-old to peel herself away from her chapter books to join in on the fun. Kids who enjoy this one might also enjoy Is Everyone Ready for Fun? from the same author. Toddlers and preschoolers doing yoga has to be the cutest thing ever, so this book delivers maximum cuteness because it steps through nine playful yoga poses perfect for little ones. My favorite is when my toddler grabs this book off the shelf, lays it in front of her, and starts moving through the poses on her own. Melts me every time. Be sure to also check out Sleepy Little Yoga, from my list of the best bedtime stories for kids that will actually calm your kid down for sleep. One final note: I’ve heard great things about another yoga book for kids called You Are a Lion! and Other Fun Yoga Poses, but we haven’t checked it out yet. If you get to it first, let me know what you think! This book comes in board book format too, which makes it perfect for the youngest toddlers who still think books are for chewing, not reading. Kids get into this one quickly because the text point-blank invites them to act out the animal movements. By the way, this book holds a special place in my heart because it was my youngest’s first favorite book – one she would ask for again and again. I actually don’t know why my kids love this one so very much, but they absolutely do. The story is cute, but they really go bananas for it. The whole book is like one big science experiment: Will it work if we breathe hot air on it? What if we use a heating pad? What if we leave it outside in the sun? When you’re done reading, put the book in the freezer to make the pictures go dark again. The kids love this part too – every time, they come up with wild explanations of why it works. My kids love the musical element of this interactive book, and they have fun imagining a rhythm along with the main character. And of course, they move their little bodies along with the rhythm. Clap, clap. Stomp, stomp. Snap, snap. This book is especially perfect for kids who love music and dancing. Aside from the fact that the wordplay in this book title makes my preschooler crack up every time, this book is a great excuse for some healthy roughhousing. As you read, you’ll pretend to turn your kid into a pizza just like Pete’s father does in the story, and your kid will eat. it. up. Warning: You may resort to ordering pizza for dinner afterwards. In this picture book, the main character keeps running into (and away from) a tiger over and over again. Your kids will have fun acting out trying to get away from the tiger. My kids love to run when it says to run, tiptoe when it says to tiptoe over the snakes, climb the air when it says to climb the ladder, and more. This picture book invites kids to pretend to be cats – they’ll meow, purr, stretch. Adorable! The last part of the book could even make this a good fit for bedtime, although you may need to follow it up with a more calming book from your collection of bedtime stories to seal the deal. Of all the interactive books for kids we’ve read, this one is my absolute favorite. In this book, the child is the one putting the parents to bed. 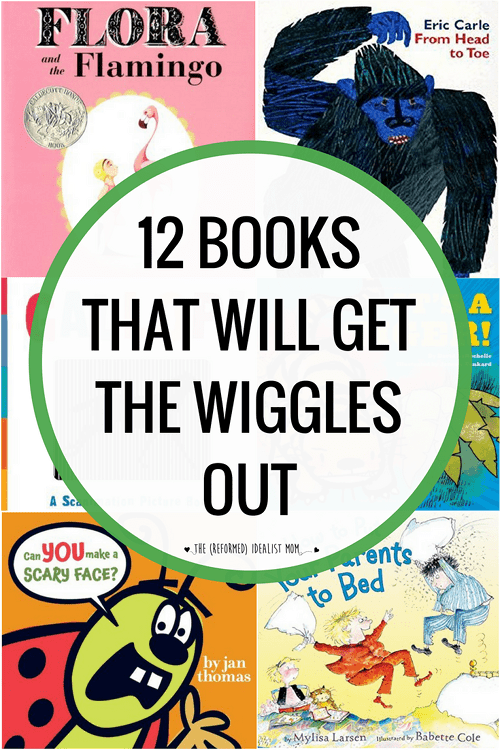 And so our favorite time to read this book is to get the wiggles out well before bedtime. We also love to use this one as a proper bedtime story – we just tone down the interactive bit as explained in my list of the best bedtime stories for kids. What are your favorite interactive books for kids? Share in a comment below! Kelly, this is such a great list of books! Some I would have probably never picked up because the cover didn’t look “cute” enough. I think I want to buy the “Keep our Secrets” book for me too. Sounds so fun! Some of our favorites are “Giraffes Can’t Dance” and of course, any of Sandra Boynton’s books are fun. “Barnyard Dance” is a perfect book for the wiggles. My kids have all love Clap Your Hands by Lorinda Bryan Cauley. Rhymes make it even more fun! I need this list, thank you for putting it together. I also like finger puppet books like little learners Itsy bitsy spider. My 2 yo love the puppet, especially when it gives her kisses and tickles. Thanks for sharing, I volunteered to read to my 2 year old’s preschool class and was looking for something to get them all involved. You’ve given me some great ideas. My preschoolers LOVED “It’s a TIGER!” They get to hop, roll, climb, duck, and run. I would love to find more books like this one. A favorite in our house is “There’s a Monster in Your Book” by Tom Fletcher. The monster is stuck in your Book and you have to shake, wiggle, blow, and yell to try to scare it away. BUT, you’ll never guess what happens when it gets scared away!